Most of us moms are very keen with our children’s milestones. In my case, deadmabelles lang ako. You can say I’m a chill mom because I’m never pressured for my children to have those age-appropriate achievements. I know it’s easy to give in to pressure, especially when there are relatives and family members who are very keen to having your lil’ ones achieve small victories. I suggest to simply keep calm and parent on! Heehee. My kids are very different in a lot of ways and one of which is potty training. Lil’ Ms. JG learned to let go of her nappy when she was more than three years old, it was a struggle because she would still ask for milk in the middle of the night and as expected, would equally go in the middle of the night, plus she really liked wearing her nappy. While lil’ Mr. JG showed signs of interest in using the potty when he was just two years old. Looking back at how I did it on each of my kids, I now know the difference. Lil’ Mr. JG started using pull pants when he was two and this immensely helped him transition from nappy to potty. 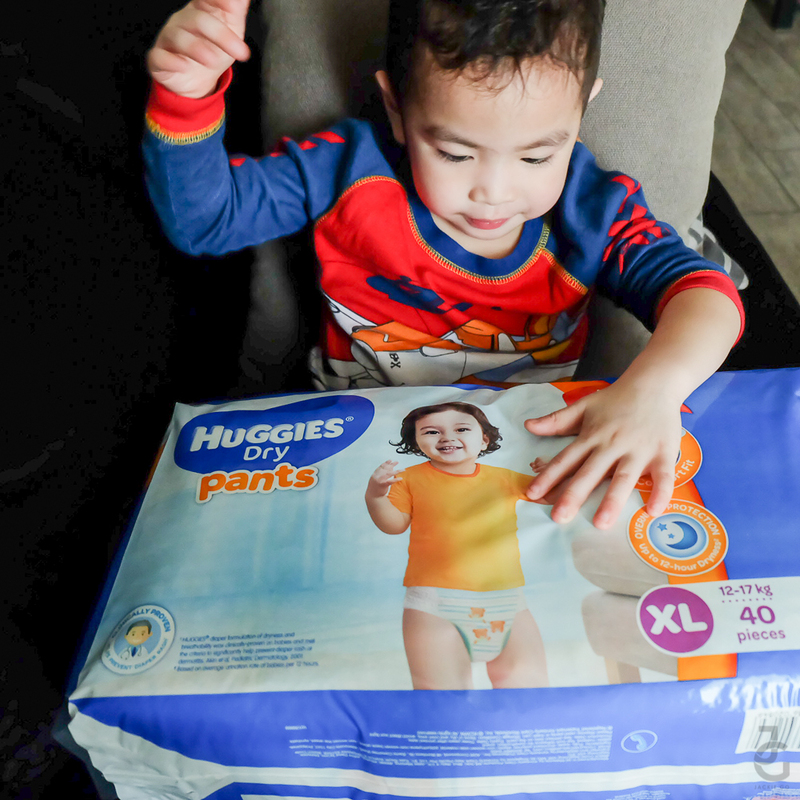 Transitioning from nappy to potty is made easy with Huggies Dry Pull Up Pants. When I asked lil’ Mr. JG why he likes wearing his pants his answer was simple, “Like a brief but I can make wee-wee on it if I can’t go to the potty.” Straight from this 3 year old’s mouth. This made him realize that he can easily pull up and pull down his pants whenever he feels like he needs to go to the potty. Currently, we’ve put a halt to his potty training, all because our pedia advised us immediately after he was confined in the hospital for severe UTI. We were told to use his pants again so we can monitor his urine output. For those of you who want to start potty training your little one, you might want to consider having these products as your training gear. Moms, it’s important to have the right products to aid you and your child so it’s easy to transition from nappy to potty. But what’s more important is that you take cue from your child. How would you know if he or she is ready to let go of the nappy? First, before removing the nappy totally, give your child time to be familiarised with the potty and how it works. Schedule potty time the moment he or she wakes up and make this a routine. Even though he or she is still wearing the nappy, just let him be inside the bathroom so he or she can associate the bathroom as a place to go whenever he or she feels the need to pee or poop. Once this becomes a routine, it’ll be easier for him or her to try and sit on the throne. Once your child figures out that the daily morning trip to the potty is mandatory, she or he might give cues that she’s ready to use the potty. If this don’t work, don’t pressure yourself nor your child. Some kids learn how to use the potty early, while some are still comfortable using a nappy. All that matters is you and your baby are stress-free and comfortable with whatever option you choose. I have new pants! I have new pants! Putting a halt to our potty training is a set back that I don’t really mind having. He might be “delayed” na in this milestone but deadmabelles lang. Seeing him wearing a nappy makes me feel like I still have a baby at home. Heehee. 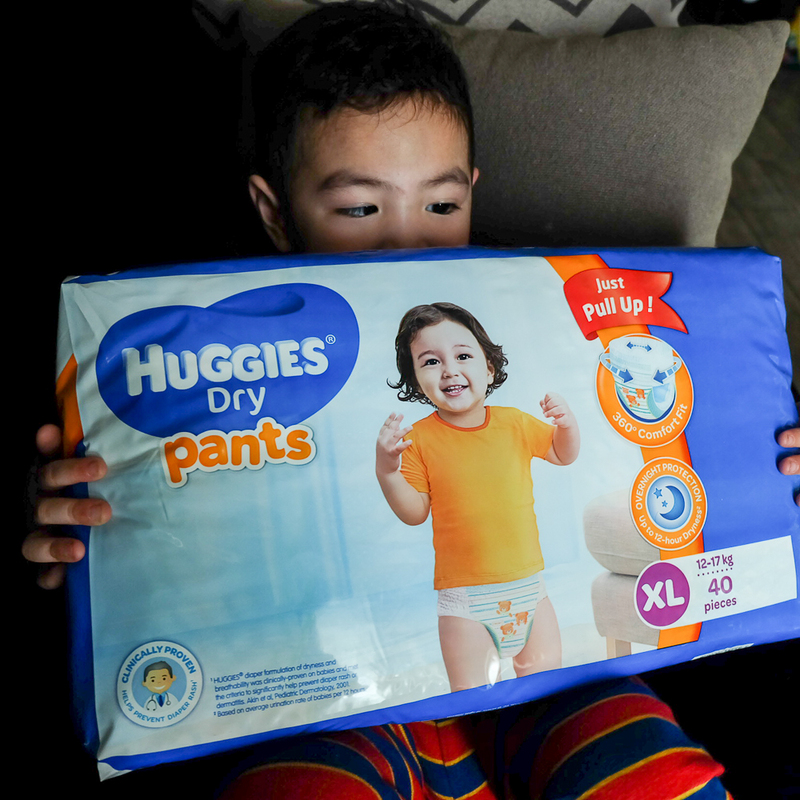 Huggies Dry Pants and Baby Wipes are available at leading supermarkets nationwide.